This data set provides spatially extensive and temporally intensive surveys of the river biogeochemistry of the Ji-Parana River Basin in Western Amazonia, Rondonia, Brazil. The concentrations of major nutrient ions, dissolved organic and inorganic carbon, pH, temperature, dissolved oxygen, and conductivity were measured in Ji-Parana River and tributary samples at the defined seasonal or monthly intervals. Dominant landuse/landcover classes, slope, and soil cation exchange capacity are included for each of the extensive sampling locations derived from river basin and sub-basin characteristics. Water samples were collected from 1999 to 2003 along the main stem of the Ji-Parana River as well as from the major tributaries including the Urupa. Shapefiles with the boundaries of the major sub-basins of the study area as well as the location of the sample collection points are included for the intensive and extensive sampling campaigns as well as the Urupa River campaign. There are six comma-separated data files (.csv) and five compressed shapefiles (.zip) with this data set. Figure 1. Map indicating the 14 sites for the intensive sampling campaign and river drainage basins. This data set was archived in June 2014. Users who download the data between June 2014 and July 2019 must comply with the LBA Data and Publication Policy. This data set provides spatially extensive and temporally intensive surveys of the river biogeochemistry of the Ji-Parana River Basin (Rondonia State, Western Amazonia). The concentrations of major nutrient ions, dissolved organic and inorganic carbon, pH, temperature, dissolved oxygen, and conductivity were measured. Landcover data of dominant land use covers and soil cation exchange capacity are included for stations in the Ji Parana Basin corresponding to the extensive sampling locations. There are six comma-separated (.csv) data files and five compressed shapefiles (.zip) with this data set. Basic riverwater chemistry and organic matter chemistry were measured nine times over a three year period at 14 sites. A more spatially extensive sampling of riverwater with the same chemistry measurements was done once in the dry season and once in the wet season at a larger set of sampling points (38 and 33 sites, respectively) within the Ji Parana Basin. Weekly collections of river water between Nov 2001 and May 2003 were done at six stations on the Urupa River for the same basic chemistry measurements. An analysis of dominant land use classes is provided for stations in the Ji Parana Basin corresponding to the extensive sampling locations. Five shape files with the boundaries of the major sub-basins of the study area as well as the location of the sample collection points available for the intensive and extensive sampling campaigns as well as the Urupa river campaign. There is also a companion file, CD06_BGC_JP_sites_coordinates.csv which contains the site coordinates, names, and site codes of the sampling sites. Note that this information is also provided in the individual data files. Sampling dates: 1999-05 to 2002-04 (no sampling day provided). Sampling dates: 1999-05 to 2001-05 (no sampling day provided). Sampling dates: 2001-11-06 to 203-05-20. Samples were collected along the Urupa River between the cities of Ji-Parana and Urupá, Urupa River at Urupa, Urupa River upstream of Urupa, and the Urupa River at Mirante da Serra. There were also two additional samplng sites however the coordinates for those sites were not provided. No sampling dates were provided for these data. There are five shapefiles provided as compressed files (.zip). When unzipped, files 7, 8, 9, and 11 contain six files (*.shx, *.dbf, *.prj, *.sbn,*.sbx, and *.shp). File # 10 also contains an xml (.xml) file, for a total of seven files. The shapefile parameters and attributes are described below. File #7: ext_sampling_sites.zip:This file depicts the sampling site locations. File #8: ext_sub-basins.zip: This shapefile depicts a smaller subset of the main study drainage basins. File #9: int_sitesI.zip: This shapefile depicts the locations of data collection stations. AREA: Possibly an extraneous field since this is a point shapefile. All values are zero. PERIMETER: Possibly an extraneous field since this is a point shapefile. All values are zero. File #10: int_sub_basinsI.zip: This shapefile depicts the area of the drainage basins. Note- when unzipped, this file also contains a .xml file. File #11: urupa_basin.zip:This shapefile depicts the area of the Urupa drainage basin. The data set covers the period 1999/05/24 to 2003/05/20. These data are useful for river biogeochemical characterization and modeling. All data sets were checked for inconsistencies. During analyses in the laboratory standard QA/QC protocols were followed with blanks and known standards run regularly to ensure the accuracy and precision of the results. Overall land-use/land cover classification accuracy was 89.12%, with an overall Kappa Statistic of 0.8667. These values were above the minimum limits for acceptance described in the literature (Ballester et al., 2001). The Ji-Parana Basin, with a drainage area of 75,000 km2, is located in Rondonia state in the southwestern Amazon Basin. The headwaters of the Ji-Parana River are formed by the confluence of the Comemoracao and Pimenta Bueno rivers. The Ji-Parana River channel has a total length of 972 km and varies in width from 150 to 500 m, whereas the channel widths of the major tributaries range from 30 to 200 m. The high and low water periods for these rivers range from December to May, and from June to November, respectively. Oxisols and Ultisols are the predominant soil types in the basin, encompassing 47% and 24% of the total drainage area, respectively. Entisols cover 14%, Alfisols 13% and Eptisols 2% of the basin. The basin was divided into 14 drainage units according to the river network morphology and degree of land-use impact. Four categories of land use impact were determined as a function of the percentage of pasture coverage: low (0 to 15 percent); medium (15 to 30 percent); high (30 to 50 percent) and very high (50 to 75 percent). For the intensive sampling campaign, water samples were collected nine times between 1999 and 2001. Samples were collected at five sites along the main channel of the Ji-Parana´ River, at the mouths of six major tributaries, and at three headwater sites, for a total of 14 sampling stations. See Figure 1. At each site, 50-100 L of water were collected from the river in the middle of the channel at 60 percent of the total depth using an electric pump. Water samples were taken from the middle of the river channel with a Niskin bottle. Aliquots of sample were filtered, stored in polyethylene bottles and preserved with thymol. Concentration of ions (Ca, Mg, Na, K, Cl and the soluble reactive form of the nutrient phosphate—PO4) were later determined in the laboratory by liquid chromatography, with a Dionex DX500. Electrical conductivity was measured in the field with an Amber Science portable meter, model 1481-61, and pH with Orion 250 A meter (Ballester et al., 2003). At each site, 50–100 L of water were collected from the river in the middle of the channel at 60% of the total depth using an electric pump. The water sample was sieved (greater than 63 um) in order to separate the coarse suspended solid (CSS) fraction, which was immediately preserved with HgCl2, to a final concentration of 100 mM. The fine suspended solid (FSS) fraction (less than 63 um and greater than 0.1 um) and ultrafiltered dissolved organic matter (UDOM) fraction (less than 0.1 um and greater than 1000 daltons) were isolated in the laboratory with a Millipore tangential flow ultrafiltration system (model Pellicon-2; Millipore, Billerica, Massachusetts, USA), using membrane cartridges having a nominal 0.1-mm pore size (model Durapore VVPP; Millipore) and a 1000-daltons molecular weight nominal cut off (model PLAC; Millipore), respectively. After filtration, the material was roto-evaporated and then dried to constant mass in an oven, both at 508 degrees C. The average percentage recovery of organic matter in all samples during ultrafiltration was 98 plus or minus 8 percent, of which an average of 20 plus or minus 6 percent was recovered as UDOM, from both forested and pasture drainage areas (Bernardes et al., 2004). Lignin oxidation, elemental, and isotopic analysis Lignin analyses were made according to the CuO oxidation procedure of Hedges and Ertel (1982) as modified by Goni and Hedges (1990). Briefly, between 30 to 300 mg of dry sample was oxidized at 1558 degrees C for 3 h with CuO under basic (8 percent NaOH) conditions. The reaction solution was spiked with a nine-compound gas chromatography recovery standard mixture (in pyridine), acidified and extracted with diethyl ether. The lignin extract was diluted in pyridine, mixed with regisil plus an absolute recovery standard, and analyzed on a Hewlett Packard 5890 series II gas chromatograph (Agilent Technologies, Palo Alto, California, USA) fitted with a DB-1 fused-silica capillary column (J&W Scientific, Folsom, California, USA). Identities of all phenols were confirmed by mass spectrometry of selected samples vs. commercial standards (Bernardes et al., 2004). Organic carbon and nitrogen concentrations were determined using a Carlo Erba CHN analyzer (Thermoquest, Rodano, Italy). Isotope measurements were performed with a Finnigan Delta-E mass spectrometer (ThermoFinnigan, Bremen, Germany) fitted with dual inlet and dual collector systems. River sites and basin characteristics were calculated using the data sets compiled as layers in ArcInfo (ESRI, 1997) Geographical Information System (GIS) and ERDASIMAGINE (Image Processing) software. To delineate subbasins boundaries of the sampling sites, a 50-m horizontal and vertical resolution Digital Elevation Model (DEM) and the river network were derived from 1:100,000 maps from the Brazilian Institute of Geography and Statistics (Ballester et al., 2003). Watershed boundaries were delineated using ArcInfo,GIS hydrological modeling tools. First, a depressionless DEM was produced by identifying and filling all sinks. Then, flow direction and accumulation were derived from this DEM, using the approach developed by Jenson and Domingues (1988). Finally, watersheds were delineated, assuming a minimum contributing area of 50 cells above a set of cells in a grid, or as the total area flowing to a given outlet (each sampling point in this case). The zonal statistic function of ArcInfo was used to calculate average values of ECEC and slope in the areas drained by each of the 14 river sectors. Ballester, M.V.R., D.D. Victoria, A.V. Krusche, R. Coburn, R.L. Victoria, J.E. Richey, M.G. Logsdon, E. Mayorga, and E. Matricardi. 2003. 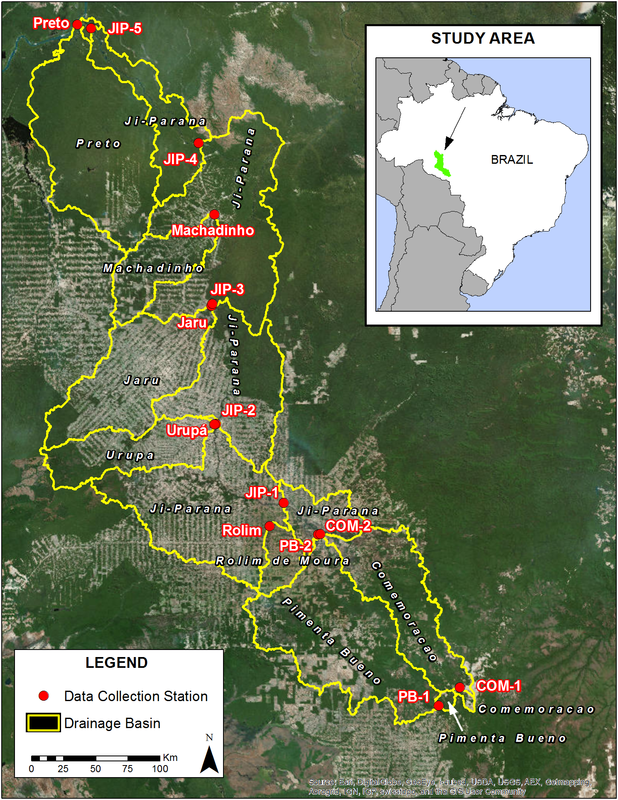 A remote sensing/GIS-based physical template to understand the biogeochemistry of the Ji-Parana river basin (Western Amazonia). Remote Sensing of Environment 87(4):429-445. Bernardes, M.C., L.A. Martinelli, A.V. Krusche, J. Gudeman, M. Moreira, R.L. Victoria, J.P.H.B. Ometto, M.V.R. Ballester, A.K. Aufdenkampe, J.E. Richey, and J.I. Hedges. 2004. Riverine organic matter composition as a function of land use changes, Southwest Amazon. Ecological Applications 14(4):S263. Cochrane, T. T., and Cochrane, T. A. (1998). SIGTERON, Sistema de Informacao Geografica para os terrenos e solos do Estado de Rondoˆnia, Brasil. (Geographic Information System for terrains and soils of Rondonia State, Brazil). Porto Velho, Rondonia: Tecnosolo/DHV Consultants, Portuguese. ESRI (1997). Arc-Info version 7.3. Redlands, CA, USA: Environmental Systems Research Institute. Gon i, M. A., and J. I. Hedges. 1990. Cutin-derived CuO reaction products from purified cuticles and tree leaves. Geochimica et Cosmochimica Acta 54:3065–3072. Hedges, J. I., and J. R. Ertel. 1982. Characterization of lignin by capillary gas chromatography of cupric oxide oxidation products. Analytical Chemistry 54:174–178. Jenson, S. K., and Domingues, J. O. (1988, November). Extracting topographic structure from digital elevation data for geographic information system analysis. Photogrammetric Engineering and Remote Sensing, 54(11), 1593– 1600. Victoria, R. L., Richey, J. E., Bernardes, M., Ballester, M. V. R., Gomes, B. M., Krusche, A. V., and Mayorga, E. (2000). Effects of land use changes in the biogeochemistry of Ji-Parana river, a meso-scale river in the state of Rondonia, southern Amazon. Proceedings of the LBA Experiment in Amazonia First Scientific Conference, Belem, Para-Brazil, June 25-28. Aufdenkampe, A.K., J.I. Hedges, J.E. Richey, A.V. Krusche, and C.A. Llerena. 2001. Sorptive fractionation of dissolved organic nitrogen and amino acids onto fine sediments within the Amazon Basin. Limnology and Oceanography 46(8):1921-1935. Krusche, A.V., M.V.R. Ballester, R.L. Victoria, et al. 2005. Effects of land use changes in the biogeochemistry of fluvial systems of the Ji-Parana River Basin, Rondonia. Acta Amazonica 35(2):197-205. Richey, J.E., A.V. Krusche, L.A. Deegan, V.M. Ballester, T.W. Biggs, and R. Victoria. 2001. Land use changes and the biogeochemistry of river corridors in the Amazon. Global Change Newsletter 45:19-22.